Start: On small hand holds just right of The Flake: a small dished out hold on the left and a small broken flake for the right. Go: Plie onto the bulge, then fire for the small horizontal crack on Testpiece. Finish straight up, the same as the Flake/Crystal variation of The Flake. Start: Same as Ratraverse and Bottom Line. Go: Up and slightly right to face holds along a right leaning crack line. Move up to the breast-shaped bulge and the twin sloped finger shelfs. Find a hidden, shallow dished out hold just above and between these holds and continue to a crack. Pull over the top and breath easier. Start: Just right of the Ratraverse bulge, underneath the obvious right-pointing horn. Go: Climb up to the horn and then over to the top. Start: Just right of The Horn, at a tiny alcove with "V" shaped flakes beneath a bulging overhang. 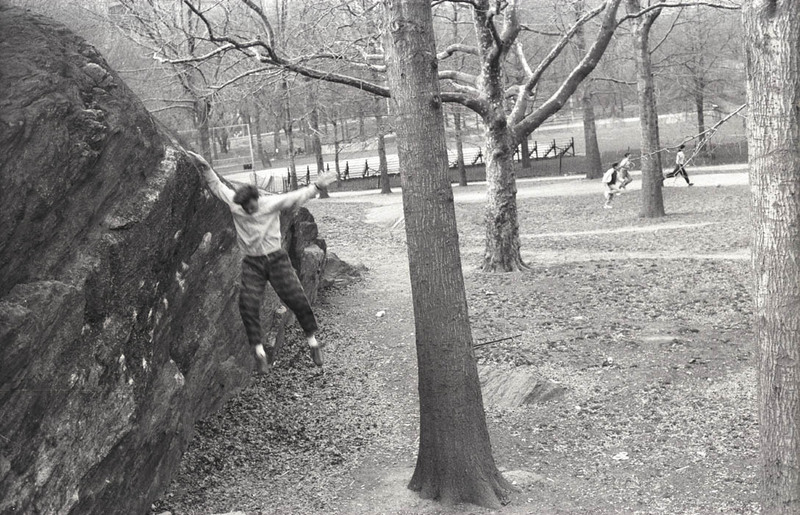 Go: Up into the alcove and then crank up and over the overhang via a wonderful assortment of holds and classic moves. 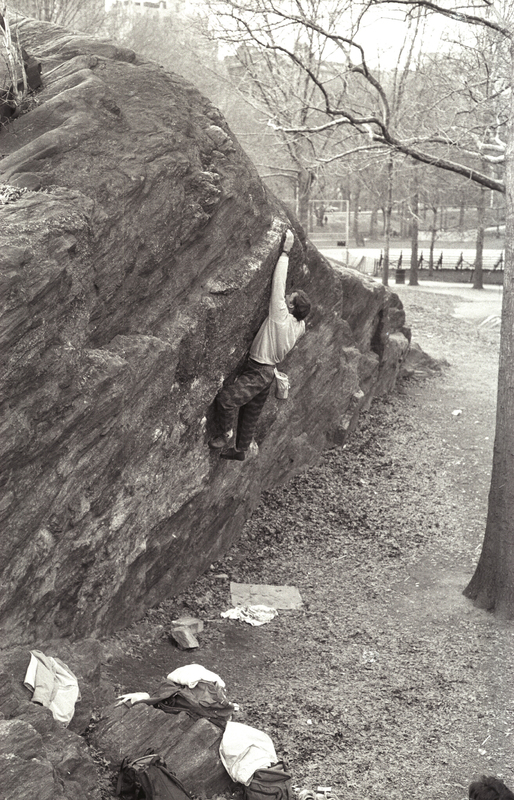 The longest boulder problem in New York City. 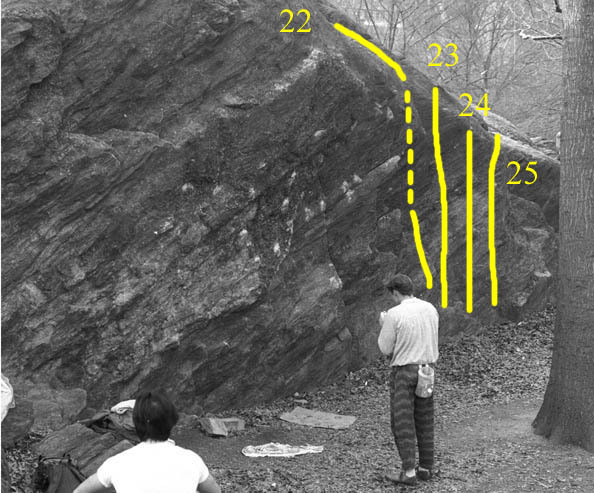 Dotted line shows the lower, safer crux variation. Start: At large holds near the middle of the Small Wall right of the obvious chimney. Go: Traverse left staying low, past Rat Hole and past large flakes beneath Easy Overhang. Continue left until the left hand reaches the low bulge start of Ratraverse. Then power straight up to the holds just left of The Horn. Move left into the big flake and continue to the rail. Traverse the long rail to the small right-facing corner at its end. Continue moving left (crux, bad landing) and traverse into the small boulder-filled gully, using small holds found just below or at the lip of the wall. Traverse until one is forced to climb up and out. 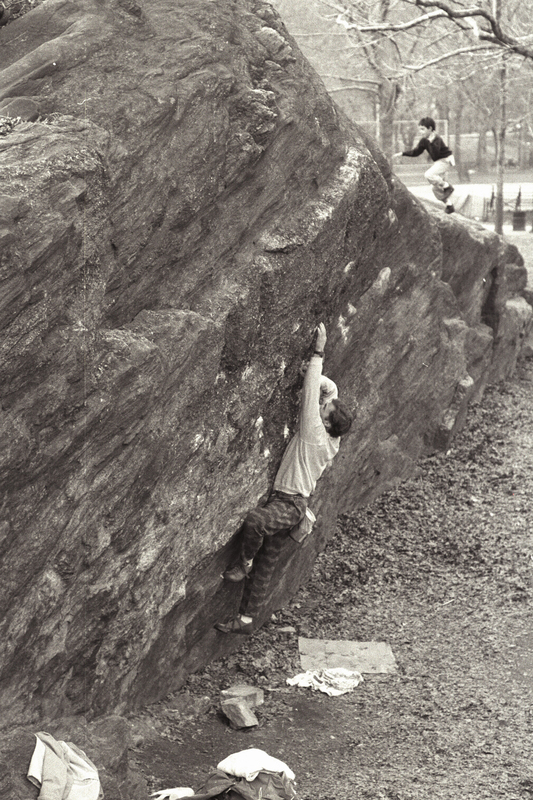 This problem was conceived as an endurance-training route and makes the most of Rat Rock's east face. 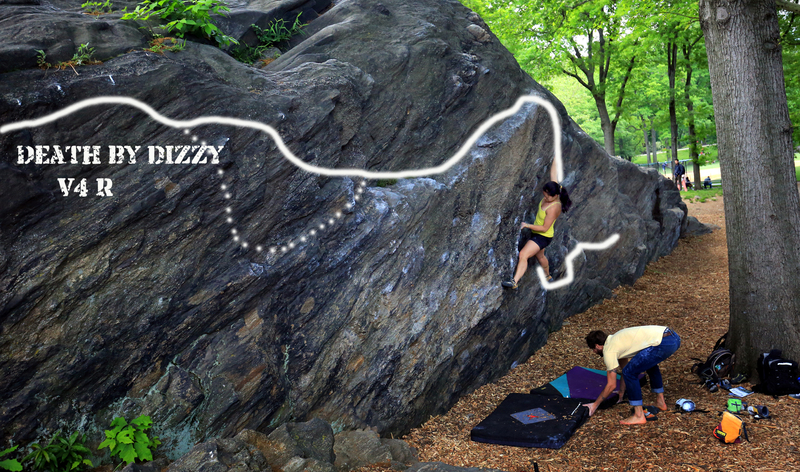 It was named in honor of a vicious rat killing by a Jack Russell terrier at the rocks right beneath the crux. 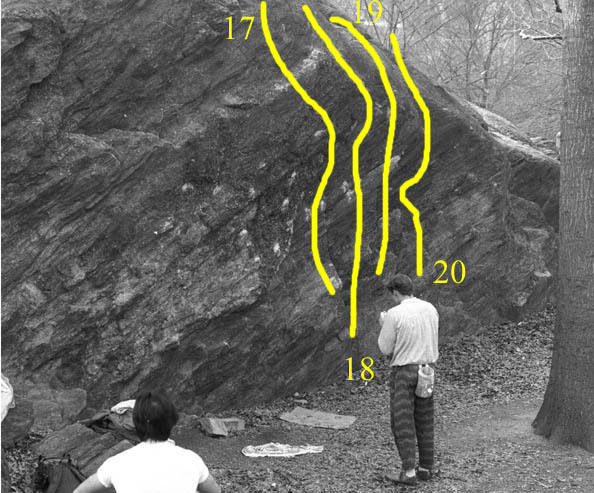 There are two different sequences by which to get through the crux. One involves using an undercling and is more dangerous if a fall were to happen. The other keeps the climber lower and is less prone to cause injury in the event of a fall. A spotter is highly recommended. Start: At the obvious narrow chimney that splits the right side of the east face. Go: Squirm up the grungy chimney to the top. Start: Just right of the littered chimney. 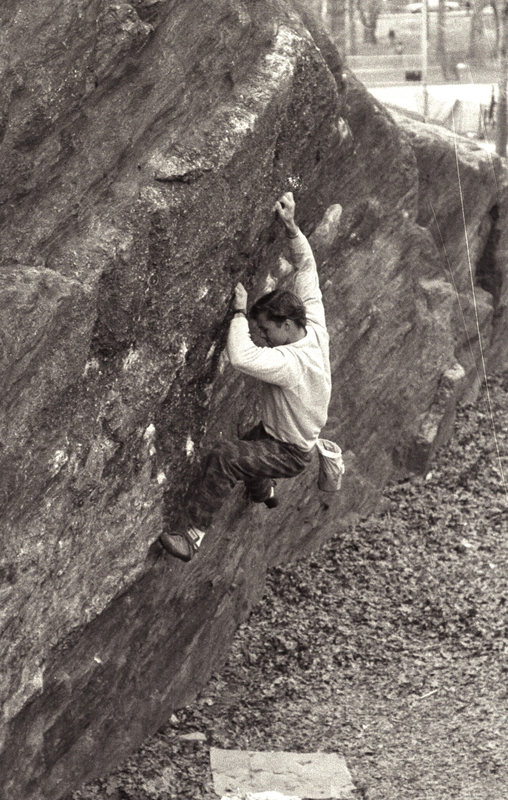 Go: Climb straight up the left side fo the small face, starting on the broken bulge and on to the thin face holds and the top. 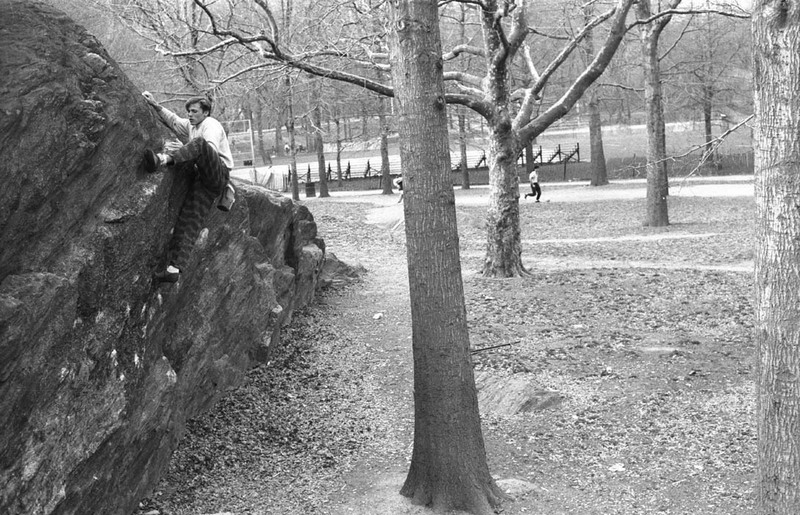 Start: On the small ledges just off the ground, right of Small Wall Left. Go: Straight up and over to the top. Start: Just right of Small Wall Middle, at the right side of the small wall. Start: Either on Easy Overhang or The Horn. Go: Hand traverse left along the edge of the top of the east face. At the top of Testpiece, look for small dished out holds that will lead you through the crux and to the rail. Continue traverse left to the right-facing corner and flakes and exit straight up. 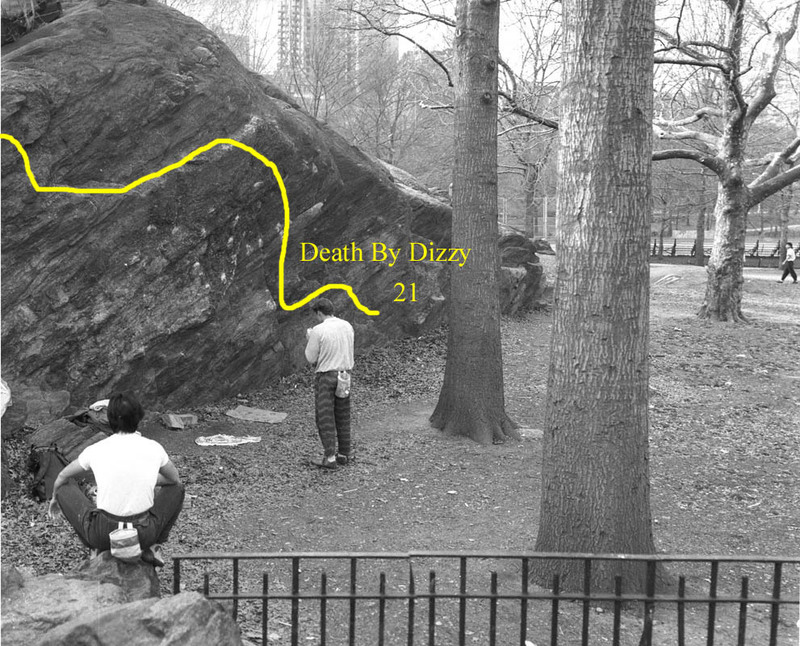 Like many other problems at Rat Rock, this one was born out of boredom. However, the crux is worthwhile and fun.